Is there a marching "Arms Race"? Over the past couple of weeks, I've had numerous conversations with directors and active educators across the marching arts pertaining to a bit of an odd trend that I've noticed over the past few years following the marching activity. Mind you, I don't have any concrete data backing any of this up, but I thought I'd throw a theory out to the world to see if anyone else agrees. Courtesy of "The Band Hall"
The corps that set the creative high-water marks for the marching activity are doing it, so marching bands follow suit. I am not certain this is 100% the reason, but it has to exert some level of influence. As stylistic influences shift and tastes change, so must the performance packages. I can tell you that a uniform that I designed and purchased back in 1999 - that absolutely looked HOT back in the day - would be dreadful today based on what else is being produced. All aspects of the visual and dramatic production are more intrinsically tied together than ever before. As more demands are placed on the performer, the artistic presence has more room to develop. 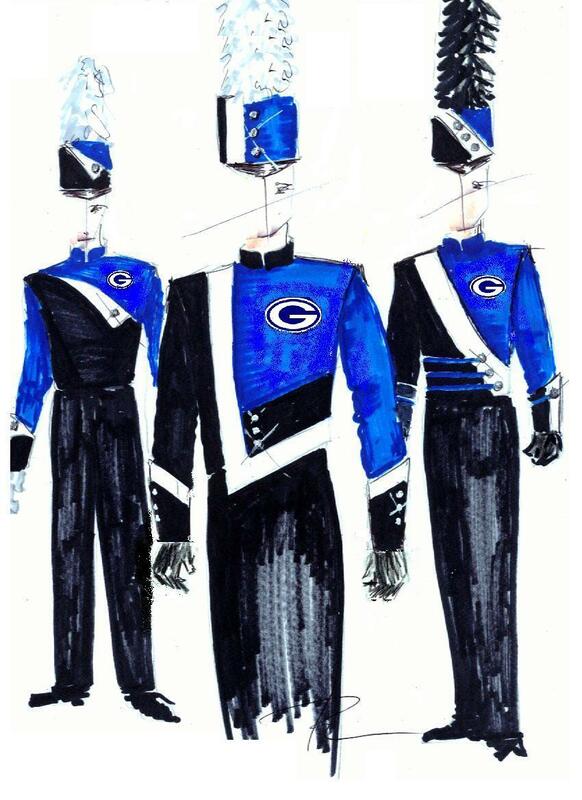 Now it's become a question of "what should the band wear", and not just a conversation about color guard costuming and flags. I don't have any concrete proof to base this on, but I'll throw it out there: Are band uniforms made as durable and made-to-last as they were in the 80s and 90s? When I marched in the Cadets of Bergen County in 1994, the jacket I was issued was part of the uniform stock all the way back to 1983. It was built like a tank, and kind of gross, but it was neat to think that someone in that jacket won DCI World Championships in 83, 84, 85, 97, 90, and 93. Since more groups are updating their look more frequently, it wouldn't surprise me to hear that they are made for a shorter shelf life than in decades past - and that's OK too. But it's not just uniforms - also electronics and amplification and props and scenery. The pendulum swings back and forth on this subject. I believe the use of heavy props are cyclical, and I distinctly recall winter programming meetings where there's a critical decision point - props vs. no props. From year to year we would swing back and forth, depending on show repertoire. Also noteworthy is the "toll" it places on the booster parents in terms of budget, transporting and logistical challenges - and that's an important part of any decision. Are uniforms being bought at a more frequent clip today?